It is Garden Blogger's Bloom Day again! On the 15th of each month, we gardeners with blogs share a few bloom photos from our gardens. Here in the Mid-Atlantic USA (USDA zone 7) on the DC-MD border, we had an especially nasty winter until two days ago, when spring sprung out and the birds sang and bulbs burst into bloom! I cut a bunch of sweet-smelling daffs to enjoy at my desk while I lay out the next issue of the magazine. So what is blooming today in YOUR garden? Thanks, Lea, and you too! No matter when they start, it's always a great thing to see spring colors popping through the ground! I'm sure it's the start of a gorgeous spring for you. You are so right, Betty, such a relief after our unusually cold winter this year. Happy Gardening! 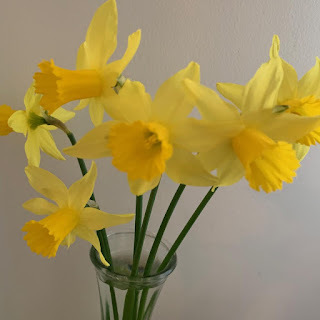 Lovely daffodils...Spring is the magical sentiment that rejoices your heart.